On the Sidebar, click + ADD WATCHERS. Note: To add yourself as a watcher, click WATCH. 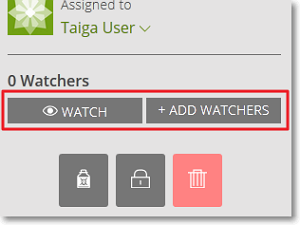 This action opens the Add watchers form. On the Add watchers form, search for a user and then click the name of that user. The user you have selected is added to the WATCHERS list on the details page of that Task. Note: To remove any user from the WATCHERS list, position your pointer over the name of that user and then on the right side, click and confirm your action.